There are a number of channels out from the Horn Island anchorage, each leading in a different direction between different islands. There are two that are potentially useful for a south-westerly exit toward the Gulf of Carpentaria, and each has its own collection of interesting tides and currents. There was quite a bit of detailed discussion about them amongst the yachties anchored behind Horn, including a fair bit of third hand local knowledge. To us it seemed fairly simple. Option One was to fight the notorious Boat Channel with its 6 knot currents and shoals, then to double back through Endeavour Strait with its rocks and shifting sandbanks. Option Two was to slip out of Normanby Passage on a rising tide and to cross into the Gulf using the shipping lane at Booby Island. It didn’t seem like much of a contest. Low tide was at dawn, but by the time we’d had breakfast and cleared the boat for sea it was closer to eight o’clock and already approaching the top of the tide (the tides are pretty strange around Thursday Island). This suited our planned relaxed start and we accepted the 3.5 knot boost down Normanby and ran gently over to Booby Island, from whence it is a hundred mile straight run down the Gulf to the company mining town of Weipa. For a while we marvelled at the feeling of travelling southward, a first for this trip. Then we sat back with Harriet at the helm and admired the pale blue skies and azure seas sparkling in the sunshine. It was Bronwyn’s watch so I went below to get some rest. After a while I became aware that the bunk was shuddering as if we were travelling at high speed, so I looked out of the saloon window and noticed that we were heeled over so far that the deck rail was in the water. Up on deck, I found Harriet steering perfectly and Bronwyn looking in some bemusement at the huge squall that was spewing out of the Endeavour Strait and rolling towards us. Hurriedly we shortened sail and Bronwyn got into her life vest and harness while I hid in the companionway under the shelter of the dodger. Then a big wave reared up and landed on her head. When we emerged from the other side of the squall, we found that while we we’d been in it, the outside world had gone grey and there were more squalls and storms on every quarter. I quickly went below to check that everything was battened down and then lay down on the bunk. Bronwyn had waterproofs, safety gear and the helm and by far the safest place for me to be if the boat was going to get a thrashing, was in bed. Night fell, and the worst of it was over. Bronwyn came below to scrape off the salt, and I went on deck for my watch. The storm had left a legacy of 25 knot winds and lumpy beam seas which made everything a bit uncomfortable. 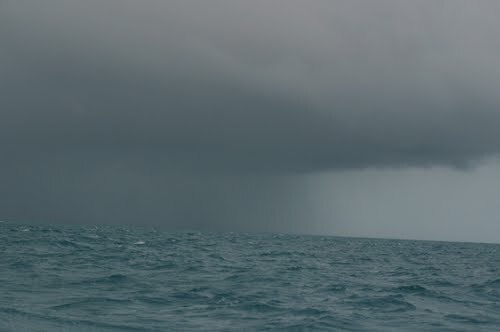 The rain had stopped, but I spent most of my watch under the dodger watching the helmsman’s position disappearing under spray as confused waves slammed into the boat. I was very glad that the wind vane was doing all the hard work. The sun came up, and we were out of sight of land and becalmed under a motionless blue sky. Flying fish scattered across the surface like little jewelled helicopters, frightened by an enormous swordfish that swiped at them with its bill. A hammerhead shark cruised by, cocking its curious head sideways to see if we were worth eating. Up above, petrels and terns wheeled and dived, taking inordinate interest in the rigging. It was all very beautiful, but it wasn’t getting us any closer to Weipa. We fired up the engine and motor-sailed. This entry was posted in Australia, Oceania, Travel, Voyage of Pindimara and tagged Gale, Sail, Torres Strait on 2009/08/29 by Reinhard. It’s a pleasure… I was using Lon’s logon!! It was really thanks to Michael Morcombe… send us picks of any others you need identified.